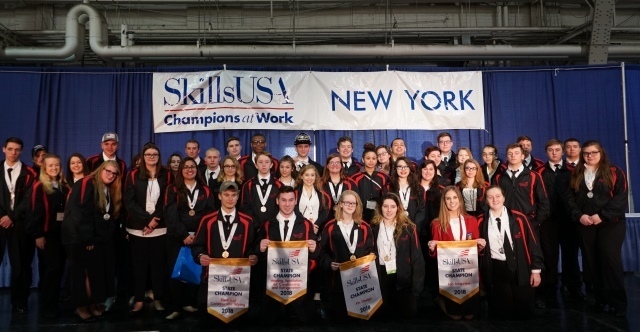 A total of forty four Jefferson County high school students from the Charles H. Bohlen, Jr. Technical Center competed in the New York State SkillsUSA Leadership & Skills Championships held April 25-27, 2018 in Syracuse. Of those, twenty students medaled in a total of 13 categories. Winning first place gold medals this year were CJ Sweetland of South Jefferson in the Electrical Construction Wiring competition; Melanie Collins and Katarina Carmen of Watertown in the Pin Design competition; Mikayla Kelley of LaFargeville in the Job Interview competition; and Brodie Price of LaFargeville in the HVAC competition. The first place winners will have the opportunity to represent New York State in the SkillsUSA National Conference held during the last week of June in Louisville, KY where they will be competing against other students from across the country. Wining second place silver medals this year were Gabe West of LaFargeville, Hollace Stevens of Belleville Henderson, Courtney Rayborn and Matthew Manning of Carthage, and Matthew Ford of Alexandria in the Quiz Bowl team competition; Brooke Dorazio of South Jefferson in the T-Shirt Design competition; Taylor Carpenter of Indian River in the Criminal Justice competition; and Shannon Sipko of Thousand Islands, Madison Hazelton of Alexandria, and Sean Gildea of Watertown in the CSI team competition. Winning third place bronze medals were Hannah Perez of Watertown in the Action Skills competition; Madison Scott of Carthage in the Cosmetology-Senior competition; Ana Bratton of South Jefferson in the Nursing Assistant competition; Loren Recore of Lyme in the Hydronic Heating competition; and Ethan Ruttan of Indian River in the Welding competition.